Not to be confused with the demon Halphas (who is also known by the name Malthus to make it even more confusing), Malphas is a demon of war and magic and specializes in (big surprise) magical warfare. Like Count Halphas, President Malphas focuses on strategy and defense first, building high towers and houses to both support his defenses and spy on the enemy. Malphas can reveal enemy secrets to a summoner as well as any news of what they have been doing. A master of magic, he can both create and destroy. He manipulates the thoughts and desires of enemies. As a master of magical creation, it seems that he is particularly involved in the building of magical artifacts, including bringing inanimate objects to life, such as golems. To advanced summoners Malphas also provides good familiars to assist in the magical arts. 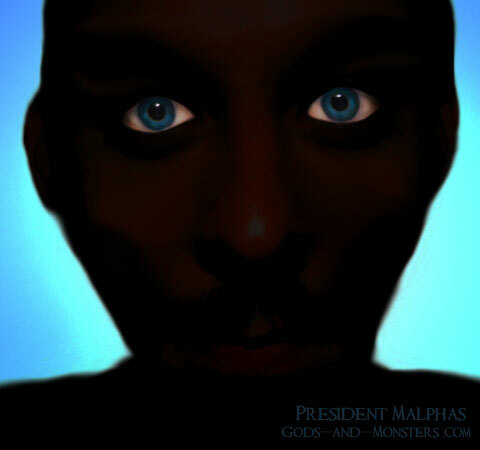 By all accounts, Malphas has one of the most powerful presences among all of the demons. When communicating with demons, an experienced summoner can usually see the aura surrounding them. The color and size of the aura are representative of one's true nature, at least in the moment. Summoners able to see the auras of demons describe a typical demon aura as being bright blue, which signifies a high spiritual level and advanced mental/psychic abilities. Of all of the demons, Malphas has arguably the biggest aura, also bright blue. It is said that one can literally feel his power through this aura alone. In fact, many times it is so bright that one can barely see Malphas at all, except for his bright blue eyes. Like Halphas, Malphas prefers a simple and functional demon form which helps him to travel around in our world fairly unnoticed. As Halphas is the pigeon, Malphas is the crow. In this form he can do reconnaissance work and spy on enemy secrets without raising suspicion. Those who have seen his human/angelic form say that he is muscularly built with dark hair, goatee, grey wings, and of course bright blue eyes. Those who attempt to summon Malphas should be aware that he does not favor sacrifices as is sometimes said. He will accept a sacrifice to him graciously, but will then deceive the summoner from that point forward. By shunning sacrifices he seems to be implying that those who overly value material things (including gifts) are not focusing their energy properly on the unseen, untouchable, and thus magical. To give a physical gift to one who values only the untouchable is not necessarily an insult, but a sign that the summoner is not ready to understand what Malphas has to teach them. Return from Malphas to the List of Demon Names.